Everyone knows the importance of radio silence to avoid detection. Modern warships have powerful computers that exchange data among ships and aircraft, but are unable to secretly communicate in a task force unless they use the crude method of flashing Morse code with signal lights or flags. A major breakthrough will occur when navies discover infrared communications. This technology has been around for decades; it's how your television remote control works. In recent years, companies such as DataSoft have developed infrared computer networks that allow mobile computers in factories and laboratories to exchange data up to 25 meters away. This technology can be used for short-range warship, aircraft, and armored vehicle communications. Each will have several emitters working like invisible strobe lights and several receivers. More power should allow ranges of up to 1000 meters, less in bad weather. However, this limited range also prevents enemy intercepts. Voice communications can be instantly digitized, sent as infrared light, and converted back into voice, so users can talk over the stealthy "IR net." Combat plans would no longer include rules for "radio silence" but rules for "IR comm only." In addition, the complex task of encryption is unnecessary. This is especially important in allied operations. During the 1999 Kosovo campaign, Serbs easily intercepted allied aircraft radio traffic when pilots were forced to communicate in the open because encryption devices were non-existent or incompatible. If aircraft have infrared communications installed, aircraft flying in formation do not need encryption with the current codes, and the enemy cannot detect or jam communications. It's possible that an enemy submarine or fishing boat with millions of dollars of infrared detection gear and the exact computers on hand to translate the infrared light may occasionally intercept messages. If this becomes a concern, ships and aircraft can reduce their infrared output power to limit range. Meanwhile, modern navies should stow their signal flags and and upgrade their crude signals devices to infrared digital communications. A final advantage of Infrared comm is the threat of Radio Frequency (RF) munitions, which may be modified anti-radiation missiles like HARM or Sidearm, or mortar rounds. With all the emphasis on technology and sensor munitions, it is amazing that RF seeking munitions have not appeared. Burst transmissions make RF targeting more difficult, but most RF conversations have so much interchange that a burst occurs every few seconds, allowing an RF munition plenty of data to home-in. In addition, a large headquarters may have a dozen radios in use, while UAV controllers provide frequent RF transmissions for hours. NASHUA, N.H. -- BAE Systems recently received a $6.6 million contract from the Defense Advanced Research Projects Agency (DARPA) to design, develop and demonstrate technologies that support the Radio Frequency Guided Munitions (RFGM) program. RFGM is planned as a passive, all-weather, and inexpensive precision Radio Frequency (RF) seeker for use on a number of different weapons. The system will be able to home in and destroy an enemy's radio communications or jamming device. The RFGM will be able to seek targets operating in a range from 30 megahertz to three gigahertz. During the nine-month Phase 1 effort, BAE Systems' Information & Electronic Warfare Systems (IEWS) in Nashua, N.H., will design and develop the Radio Frequency antenna and receiver hardware, and signal processing software to detect, discriminate, and geolocate an RF emitter. Aaron Penkacik, vice president of the company's Advanced Systems and Technology organization, said, "We have a world class team that brings together BAE Systems' experience in signal processing, inertial measurement units, and munitions know-how to address this critical war fighter need." The BAE Systems team includes Draper Laboratories and BAE Systems Land Systems. At the end of Phase 1, BAE Systems will test and demonstrate the system's performance against multiple emitter types. DARPA's goal is to demonstrate that an 81mm mortar round is capable of receiving RF communications signals, determining the location of the emitter, and maneuvering in flight to impact near the target emitter. The QuickLink Mobile Wi-Fi Seeker is one very slick little piece of technology. Have a laptop? Travel with it? Ever wish you could quickly and easily find a wireless hot spot? If the answer is "Yes", then whether you're in an airport, another office or even at home, the QuickLink Mobile Wi-Fi Seeker will help you zero-in on the best access point. Without having to boot-up your computer, the QuickLink Mobile Wi-Fi Seeker will find the strongest wireless (802.11 b/g) signal. Without fail. Time is saved, money is saved, and frustration is totally avoided. It's that simple. QuickLink Mobile Wi-Fi Seeker is easy to use. Simply point the QuickLink Mobile Wi-Fi Seeker in any direction. Push the button and hold it down. That's what activates the QuickLink Mobile Wi-Fi Seeker. The red lights sweep back and forth. If there is a wireless access point within 300 feet, the WiFi Seeker will find it! When the red lights stop sweeping and remain lit, you've located an (802.11 b/g) access point. The more red lights that stay lit, the stronger the signal. If the red lights don't stop sweeping, point the QuickLink Mobile Wi-Fi Seeker in a different direction. 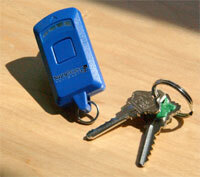 QuickLink Mobile Wi-Fi Seeker is compact and convenient. Easily attach it to a key ring, a zipper-pull on your laptop case, or wherever else you find convenient. Standalone device: no computer required. Fast detection: signal typically found in less than 1/2 of a second. 4 bright LEDs for easy and accurate indication. Directional antenna helps locate access point. Small and lightweight for maximum convenience. Not fooled by other RF emitting devices such as cordless telephones, baby monitors or microwave ovens. This is an amazing small RF detector. They can tweak it to look for any RF signal and make it bigger for more range, and maybe have a audio beeper. It can be mounted on a soldier's helmet, using the mount already there for a night vision device. A wire attached earplug provides an audio signal rather than lights. When patrolling, soldiers will hear beeps indicating a burst of RF activity caused by walkie-talkies or cell phones. They will stop and take cover, then look around until their helmet mounted RF device's audio beeps are quickest, telling them the direction of whoever is emitting RF signals. They will move off the road or trail to avoid a mine or bomb and chase down the source. The bad guys may never determine how these patrols always avoid their ambushes and find them. After reading your article regarding using infrared semaphore communications in naval applications, I was struck with one simple question. Why didn't the use of lasers cross your mind? Infrared light is omni-directional and is quite visible to off-axis sources. The same cannot be said for lasers, a laser link is virtually invisible to any source not directly in line with the transmitter. There is also the issue of greater range & performance in all weather conditions. Just something to think about. Ed: Several readers sent e-mails about the use of lasers for communication. Lasers are far more complex since the beams must be aimed directly at the receivers. For a formation of moving aircraft or ships, it becomes a large complex system to keep several beams "stabilized" on distant points. I think lasers could work for direct ship to shore comm during amphibious operations, but IR systems already exist which are much smaller and less complex for multiple moving platforms. I found your essay on the subject and ask that you would call up my patent 5,159,480, Infrared Widebeam Communication Transmitter. Our work in the late 1980's included putting music and voice on the IR carrier; we achieved ranges of over 5,000 yards (from/to bridges over a long, straight stretch of railroad track in the swamps northwest of Norfolk. We were not aware of any protocols at the time. My company was the OEM for the Fresnel lense used on the SAT-2 IR morse blinker then (and still) in use in the USN. We wanted to to make a new SAT ( ) which would be capable of inter-ship voice and data transmission, but never managed to interest the Navy. A colleague gave me a copy of an article which you wrote some months ago on the use of infrared communications by modern navies. I thought that you might be interested on development in the field of discussion. Since 1998 several navies in NATO use an advanced digitally encoded multi-channel two way infra red voice communications system for both surface ships and submarines. These systems allow the users complete freedom of movement, in many areas of the ship, while maintaining fully voice communications with the ships systems. The wireless infra red system is used for security on the bridge and in the ops’ rooms but also in areas of high electrical noise or sensitive electronics. Examples of an area of high electrical noise are the machinery spaces. Here digital infra red systems offer one of the only options to crystal clear speech which is not effected by the electrical noise caused by the modern ships propulsion systems. In addition the infra red is totally safe to be used near sensitive control system, unlike low powered radio which frequently causes control loops to go unstable of for shutdown systems to trip machinery. In addition even low powered portable radios can be detected miles from the ship when used below decks. The low levels of encoded infra red make these systems complete eye safe and they are categorised as Class 1. Originally developed for the “Flyco” officer on aircraft carriers, several navies now use the enhanced version which allows the reception a different channel in each ear with the user having the option to select which channel to reply. Even some of the world's smaller navies have now banned the use of radio for internal wireless communications and the option of digitally encoded infra red is being considered as the only viable option.